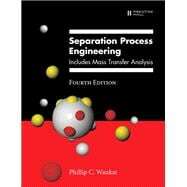 Separation Process Engineering, Fourth Edition, is the most comprehensive, accessible guide available on modern separation processes and the fundamentals of mass transfer. In this completely updated edition, Phillip C. Wankat teaches each key concept through detailed, realistic examples using real data—including up-to-date simulation practice and spreadsheet-based exercises. Wankat thoroughly covers each separation process, including flash, column, and batch distillation; exact calculations and shortcut methods for multicomponent distillation; staged and packed column design; absorption; stripping; and more. This edition provides expanded coverage of mass transfer and diffusion, so faculty can cover separations and mass transfer in one course. Detailed discussions of liquid-liquid extraction, adsorption, chromatography, and ion exchange prepare students for advanced work. Wankat presents coverage of membrane separations, including gas permeation, reverse osmosis, ultrafiltration, pervaporation, and applications. An updated chapter on economics and energy conservation in distillation adds coverage of equipment costs. This edition contains more than 300 new, up-to-date homework problems, extensively tested in undergraduate courses at Purdue University and the University of Canterbury (New Zealand). Phillip C. Wankat is Clifton L. Lovell Distinguished Professor of Chemical Engineering and director of undergraduate degree programs at Purdue University’s School of Engineering Education. His current research interests include adsorption, large-scale chromatography, simulated moving bed systems, and distillation, as well as improvements in engineering education. He received the 2007 Distinguished Education Alumni Award of Distinction from Purdue’s College of Education, and the 2005 Shreve Prize in Chemical Engineering. With K. S. Knaebel, he contributed the Mass Transfer section to Perry’s Chemical Engineers' Handbook, Eighth Edition (McGraw-Hill, 2008).